The Indian Content Leadership Conference and Awards 2018 recently took place in Worli, Mumbai. BankBazaar is a name that is becoming increasingly synonymous with personal finance in India. It provides its users with a plethora of information on financial products and services like loans, credit cards, EMI calculator, among other things. It also enables its users to check and keep track of their Experian Credit Score. The Personal Finance feature helps users get an aggregated view of personalised monthly graphs to track spends and a real-time snapshot of the aggregated balance across multiple savings accounts. It also allows users to set reminders for Credit Card EMIs and bill payments. Happy Roads is a travel app offered by Bharat Petroleum Corporation Limited that aims to inspire and help people go on road trips in and around Bangalore. Using their extensive network of fuel stations, the app assures a smooth journey by mapping out a smart itinerary and creating a list of essential services like pharmacies, ATMs, restaurants, et cetera that are on the way. ShareChat is a social application that supports several Indian languages like Hindi, Telugu, Bengali, Tamil, Odia, and many more. Just like any other social platform, the app can be used to interact with others and share jokes, videos, etcetera. 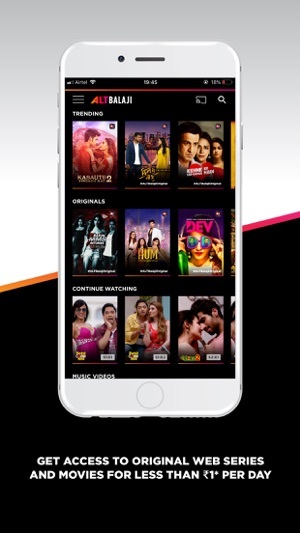 ALTBalaji is a subscription-based application wherein users can watch shows written by famed writers on demand. The app covers various genres such as comedy, drama, thriller, mystery, action, romance, and many more. Furthermore, these shows are available in multiple languages.